Novice decorators may want to create a preliminary sketch of their cake design, but may not have the skills needed to sketch out a fully decorated cake freehand. If that sounds like you, consider using an online tool to help bring the vision in your head into reality. 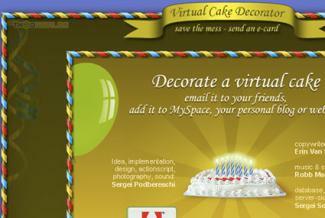 Only a few websites allow users to design cakes online. Give one of them a shot before you attempt to make your own cake. Designed by the Bride allows users to create a three-tier round cake. While the tool is geared towards brides, the cakes would also be appropriate for garden or floral themed parties, birthdays, and anniversaries. The basic program, while limited, is free and easy to navigate. 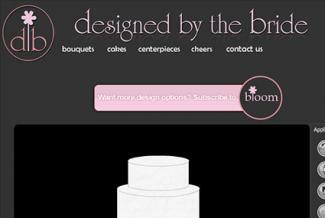 Simply follow the four tabs at the bottom of the blank cake to choose your cake, icing color, pattern, and accessories. Tools along the right side of the cake allow you to rotate the cake, enlarge or reduce accessories, flip items, print, share, and more. 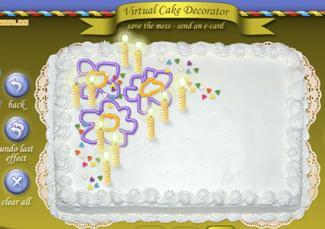 The program moves smoothly - you can easily navigate and place items on the cake. Additionally, saving and printing your final design is a great option if you need to use it as a reference. The Flip, Bring to Front, and Bring to Back Buttons in the right hand toolbar also allow more customization, as does being able to resize your accessories. Payment Required for Additional Options: To get more than one cake shape, two icing colors, two icing patterns, nine pattern colors, and additional accessories, you need to subscribe to the website. Subscriptions start at just $5.99 for one week but cost about $90 for an entire year. Subscriptions will get you both round and square cakes with 30 color options and 10 patterns, background color options, containers, and additional accessories like shells and leaves, along with 200+ flowers. 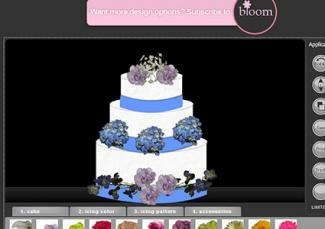 Geared Toward Weddings: Even if you purchase the subscription, the cakes are primarily geared toward weddings. While you can use them to design, say, an anniversary cake, ocean-themed cake, or garden cake, you won't find any children's options, masculine options, or contemporary designs. 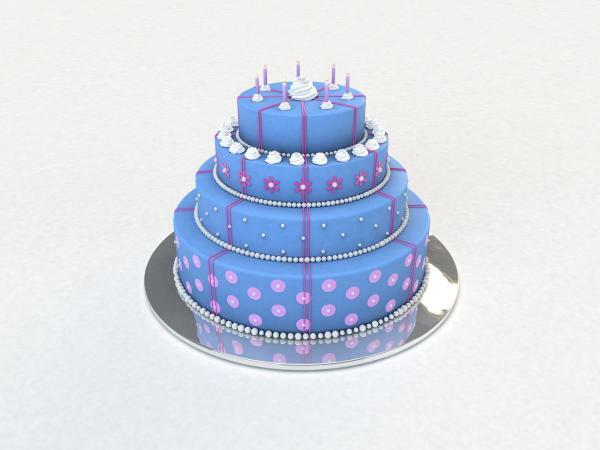 The free Virtual Cake Decorator was designed to help users create birthday cakes, but options could be put together to create a cake for another occasion as well. To begin, select the Start button. Use the tabs at the bottom to navigate among the decorating options, which include freehand options in a variety of colors and three tip sizes; embellishments like flowers, stars, and sports items; and number-shaped candles or four colored candles. When complete, choose the Done button and you receive a box with the option to send to a friend or embed in your website. Decorators can use the tip option to create basic freehand designs. Embellishments go beyond traditional wedding graphics and could be used to create a cake for another occasion. The cake is set up like a sheet cake rather than a round tiered cake. Until you press the sound button before you click on Start, a very loud song plays automatically. There is only one cake size and base frosting color - rectangle in white. Even though the freehand option is helpful, you won't be able to create an extremely detailed picture. Local bakeries will sometimes have their own program allowing customers to design a cake online. Check with bakeries in your area to find out if this is an option. For example, Dierbergs allows customers to choose their own cake size, theme, elements, colors, and message for customers in select Illinois and Missouri locations, although they will not see a graphic of the cake options put together. In the Kansas City area, check out Iced Art Cakes by Design, which allows customers to design a cake by picking out serving number, setup, shape, design, icing, flavors, and filling. Examples of some design elements are shown, but you don't get to see your completed design. Whether you plan to make the cake yourself or you want to buy one from a bakery, using online tools like decorating websites and programs, will help make designing a cake easy. Using these helpful programs is sure to result in a delicious and delightful looking cake.